For construction site safety, Best Ed offers vests, jackets, and high visiblity clothing that can be screen printed or embroidered with your logo. Volume pricing and speedy delivery. Click here to learn more. 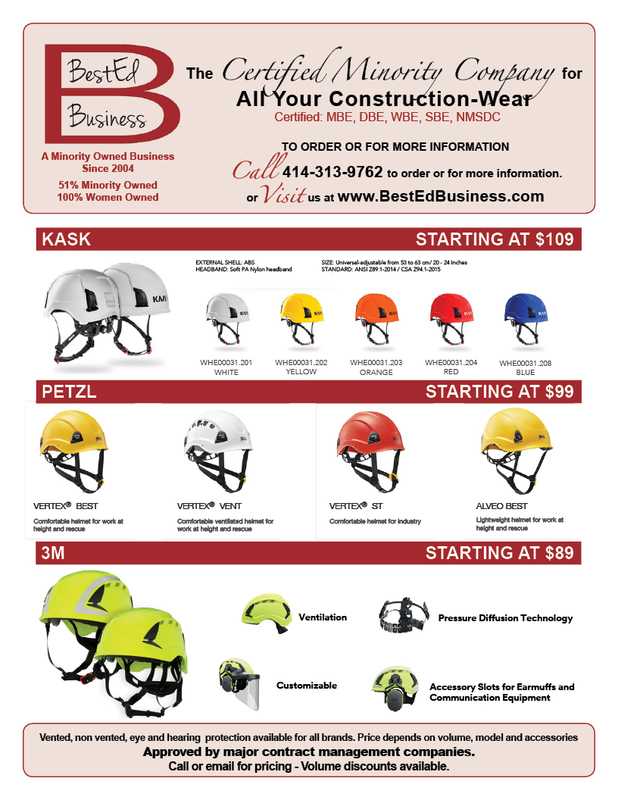 BestEd is a distributor of new hard hats/helmets that are being recognized by the construction industry for their enhanced safety and protection Accessories include eye and ear protection. Click here to view more. Safety goggles/glasses come in all sizes, colors and finishes and provide maximum coverage to prevent on-site accidents. Readers and full sun protection are available. Gloves can be ordered for winter, summer, full protection and swipe fingers, allowing use of phones and ipads on the site. Ear protection is available in small or large quantities, re usable or disposable. Dispensers are available for on-site convenience.